Avinash De Sousa's valuable review (De Sousa, 2013 , ) contains clear summaries and discussions of the major approaches to the mystery of human consciousness. De Sousa even includes controversial approaches, such as hypotheses that locate the significant phenomena of consciousness at the quantum level (e.g., Penrose, 1994  ; Hameroff, 2007  ). This is as it should be. That way the reader can decide for himself or herself which approaches hold the most promise. While the future science of consciousness will surely exist on many levels-there will be a neurochemistry of consciousness, a cognitive neuroscience of consciousness, a social neuroscience of consciousness and perhaps even a physics of consciousness-the issue remains which level will yield the information we need to take consciousness from the realm of mystery to the realm of the understood. Each of the levels is a candidate in this healthy competition, with its proponents. There are several signs by which we will know which one is the winner-which one was able to offer the most satisfying, most unified explanations of the phenomena of consciousness: how does consciousness relate to perception, to dreams, to our ability to represent the world? Is there a self? What is the function of consciousness, and how does the brain generate all the colours, sounds, smells, feels and emotions that we know consciousness by? We also need to affect and manipulate consciousness in order to correct its disorders: Coma, schizophrenia and autism to name a few, and we need the crucial theory that will make this possible. The most prudent approach is to begin at the level we have the best grasp of, that of biology and move down to the lower levels of chemistry, then physics only on an as-needed basis. In biology, we can begin with the upper levels of brain theory covered by cognitive neuroscience, and again, move down to the level of small sets of neurons or within the neuron itself as necessary. One sign that the quantum approach has little to offer, at least at this point in time, is the way that De Sousa's review goes from being easily understandable to largely opaque when he describes them. De Sousa suggests one similarity that may link quantum phenomena and the phenomena of consciousness: "What the uncertainty of thoughts does have in common with the uncertainty of particles is that the difficulty is not just a practical one, but a systematic limitation which cannot even in theory be circumvented" (De Sousa, 2013  ) . I would suggest that new types of theories, coupled with a working out of their practical consequences and applications, could solve both of these problems. In my response, I will focus on what I believe to be the crux of the problem of consciousness, which De Sousa treats in section 2.5 (De Sousa, 2013  ): The role of fronto-parietal circuits in consciousness. This question, about whether conscious states can exist in the posterior portions of the cortex without active connections to portions of the prefrontal cortex, both allows us a way into the questions of what and where conscious states are, as well as an approach to a fundamental metaphysical question about consciousness, whether all conscious states contain a sense of self, or contain our awareness of them. A distinction can be made between the mind-body problem and the problem of consciousness, which is then seen as subset of the former. The current form of the mind-body problem is: How do we explain the mind in straightforward physical terms, the same terms that we might use to explain the heart or the lungs, for example? What makes the mind-body problem so difficult is the notion that the world of consciousness is only directly accessible to the owner of the brain in question. This makes the mind appear to be different from every other physical thing we know of. And that is where almost every current thinker, including De Sousa, is stymied, since getting around this wall of privacy appears to be impossible. In his concluding section, De Sousa says, "the will of another, despite being tied closely to processes in his or her brain, cannot be completely decoded by an outsider, and is, therefore, not objectively understandable." And, "in fact, complete mindreading is beyond human capabilities" (De Sousa, 2013  ) . Claims of this sort are what make the mind-body problem appear to be ultimately insoluble. The way around this impasse is to see that it is possible to connect the prefrontal lobes of one person's brain to the parietal/temporal lobes of another person's brain in such a way that the first person can directly experience the conscious states of the second person, something I call 'mind melding' (Hirstein, 2012  ). The mind-body problem breaks into two sub-problems-the problem of consciousness and the problem of the self. This allows us to separate questions about how we access our conscious states from questions about the conscious states themselves, and it is this latter question that is the problem of consciousness. The problem of consciousness is contained in the question: How does the brain produce conscious states? How does it bind them, how does it fill them in (e.g., filling in of the visual blind spot), how does it produce all the different qualia, the colours, sounds, tastes and feels? If you go on to ask why your perspective on your qualia is different from that of the scientist looking at your brain from the outside, you have moved to the other half of the mind-body problem, the problem of the self. The self appears to have a special inner access to consciousness that is not available to the scientist. I believe that the problem of consciousness has already been solved. The process of consciousness is the same process by which large areas of the thalamus and cortex are bound by electrical oscillations (Crick and Koch, 1990  ) . We know how conscious states are bound, and how they are realised in cortical tissue. They consist of cortical areas bound by thalamo-cortical oscillations. Sometimes De Sousa also identifies consciousness with thalamo-cortical oscillations, as when he notes (in section 3.6) (De Sousa, 2013  ) that in preterm infants, "the thalamo-cortical connections are not yet fully established, which is why it can only reach a minimal level of consciousness." One apparent problem with this approach is that it seems to be committed also to the idea of consciousness existing in small patches of brain tissue (see Section 3.1) (De Sousa, 2013  ). I do not see a special difficulty here though. The question, "Is that set of ten neurons conscious?" is similar to the question, "Is that set of ten atoms radioactive?" or, "Is that group of ten H 2 O molecules wet?" All three questions sound strange because consciousness, radioactivity and wetness are properties that only fully emerge once enough of the relevant objects aggregate. Consciousness can be generated in small quantities of brain tissue, but its computational power and effectiveness in the world require a massive supporting system of perceptual organs, executive processes to direct processing, and effectors to create behaviour that alters the environment. In order to solve the problem of the self, the second part of the mind-body problem, one would have to find a way around the apparent wall of privacy. The self is largely realised in the brain's prefrontal executive processes (Hirstein, 2011  ). If we connect one person's prefrontal lobes to an area of cortex bound by thalamo-cortical oscillations in the posterior portions of another person's brain, we will have breached the wall of privacy and solved the second problem, the problem of the self. Contrary to what most philosophers and scientists had thought, conscious states are not inextricably bonded to a single self. Rather, this bond can be broken and the conscious state, while remaining intact, can be bonded to another self (Hirstein, 2012  ). Does consciousness require prefrontal activity? However, the view that conscious states always require fronto-parietal activity locked together stands in the way of mind melding. It implies that what is going on in the parietal and temporal lobes of the second person is not itself a conscious state, but merely an incomplete part of one. If so, then the first person is not actually getting in touch with a conscious state of the second person. In order to meet this objection, evidence that conscious states can exist in full in the parietal and temporal lobes, without connections to the prefrontal lobes, is required. The main piece of evidence that makes people claim that fronto-parietal activity is required for consciousness is that fronto-parietal activity is widely reported in the brains of conscious people. This finding has now been made countless times, using every method of brain imaging and activity monitoring available to us. However, these are more complex, more sophisticated conscious states, states of self-consciousness. There is another type of simpler conscious state that I call a state of bare consciousness, in which only the cortex in the back of the brain, in the parietal or temporal lobes, is active. When De Sousa says, "although activity in ventral visual cortex is a consistent neural correlate of visual perception, it might be insufficient to produce awareness without an additional contribution from …prefrontal areas" (De Sousa, 2013  ), I agree. However, awareness is different from consciousness. Whenever there is a state of awareness in a person's brain, that person is aware of something. This means that awareness is a type of self-consciousness. I think De Sousa is fundamentally correct in stating that phenomenal consciousness is mainly associated with activity of sensory regions (I would include the parietal lobes here, since they are primarily sensory regions, for sensing the body and its surrounding space), whereas, access consciousness requires the additional involvement of frontal areas (see Block, 1997  , for the phenomenal/access distinction). De Sousa lists some of the best evidence in favour of the view that consciousness can exist in the posterior region of the cortex alone, which is also shared by Zeki (Zeki and Bartels, 1999  ) and Lamme (Lamme, 2003  ). Gennaro (Gennaro, 2012  ) also contains an excellent catalogue of such evidence. The next section contains a list of such states. Consciousness in animals and human infants may also exist without accompanying prefrontal activity, because the sort of prefrontal processes needed either do not exist, as in the animal brain, or are not yet properly connected by white-matter fibres, as in the brains of infants. When subjects are engaged in a perceptual task or absorbed in watching a movie (Goldberg et al., 2006  ), there is little prefrontal activation. Tong (Tong, 2003  ) argues that interaction between V1 and other posterior visual areas is sufficient for conscious visual states. Frontal lesions typically do not impair conscious perception. Rather, as De Sousa puts it, prefrontal activation "during conscious perception tasks may reflect additional reporting or working memory processes unneeded for conscious experience" (De Sousa, 2013  ). The only correction I would make to this is to change the last phrase to "conscious states," since experience requires a subject of that experience, which would be embodied in the prefrontal lobes. There have also been several cases in which humans sustained extensive prefrontal damage without losing the ability to be conscious. Prefrontal lobotomy did not eliminate consciousness, although it only disconnected circuits in the ventral medial prefrontal lobes. Frontal lesions may prevent patients from reporting what they perceive, but we are, I hope, a long way past the behaviouristic notion that only events that can be publicly reported exist or are proper objects of science. One clear sign that consciousness is not coextensive with the realm of the reportable is that we are constantly in situations in which we can report only a small subset of what we were aware of. For instance, if a five-by-five array of numbers is briefly projected onto a screen in front of me, I am aware of a five-by-five grid of numbers, but I can only report a few of them (Block, 2007  ). Deep meditative states also appear to involve a quieting down of prefrontal activity (Lou et al., 2005  ) while consciousness continues, albeit in a modified form-without a self, as the practitioners say. 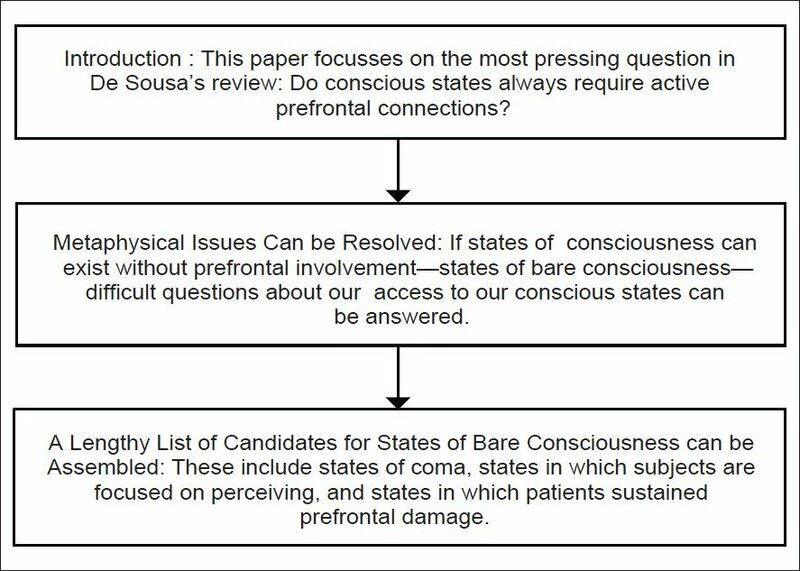 Some types of coma patients may also be experiencing conscious states without prefrontal activity. The absence of prefrontal activity explains why they are unable to communicate or, in the case of locked-in syndrome, unable to signal their thoughts in any way. Nevertheless, recent studies have found that coma patients are able to respond to commands to imagine engaging in different activities-for instance, one woman was asked to alternate between imagining playing tennis and imagining walking through the rooms in her house. While she engaged in these two tasks, the posterior portions of her brain showed the same sorts of activity that would occur in normal people who engaged in such imagination tasks (Owen et al., 2007  ). Some autistic conscious states may also be a counterexample to the idea that consciousness occurs only when there is an appropriate accompanying prefrontal activity. Several recent studies have found that white matter connections between posterior cortex and the prefrontal lobes are absent in the autistic brain, and that this may be the central problem in autism (Kana et al., 2011  ). Monk et al. (Monk et al., 2009  ) found increased connectivity between posterior cingulate cortex and temporal regions in their autistic subjects. They also found that worse social function was associated with decreased functional connectivity of posterior cingulate/precuneus and the medial prefrontal cortex. The idea that processing is "backed up" in the autistic brain, unable to move forward to contact prefrontal executive areas, which are, hence, themselves likely to be underdeveloped or non-existent, might explain why many autistic people have trouble communicating what they are perceiving or thinking. But nevertheless, the posterior activity is taking place. Sometimes, as in the case of certain autistic savants, the posterior perceptual activity is clearly very rich and detailed. There have also been many instances in which autistic people, with intensive training, have gained the ability to communicate their conscious experiences, which affirms the suspicion that the experience was there all along. De Sousa also mentions some other pathological states that might represent states of bare consciousness: "Hemineglect, abulia, akinetic mutism, anosognosia, impaired autonoetic memory, loss of intentional control and a surge of automatic activities such as utilisation and imitation behaviours" (De Sousa, 2013  ). Each of these types of states needs to be examined to determine whether they are in fact states of bare consciousness. If such states exist, the mind body problem and its sub-problem, the problem of consciousness become much more approachable. The salient points of this paper are as follows: We should pursue biological level theories of consciousness and exhaust their possibilities before turning to approaches at the level of physics. The mind-body problem is composed of the problem of consciousness and the problem of the self, that is, the problem of how to explain why our access to our conscious states differs from the access that other people have to our conscious states. It is important to realise that peoples' brains can contain conscious states which they cannot describe or even know about-states of bare consciousness. Certain states of coma and autism may be states of this type. Realising that such states exist allows us to break the link between consciousness and our awareness of it, and that allows us to solve the mind body problem in two steps: The problem of consciousness and the problem of the self. Once we get past the hurdle presented by the appearance of privacy, several good things happen. First, we no longer need to issue the standard dicta about how science can never fully understand the mind. Second, our temptation to grasp at extreme positions, such as the quantum consciousness view, will be substantially reduced. If it was a sense of mystery toward consciousness that made us want to pair it with the mysteries of quantum mechanics, the need to do so should subside. One more subtle reason behind the near-universal acceptance of privacy and its permanent mysteries is that the view is so flattering to us. It makes us deeply unfathomable creatures, different from everything else in the universe, at least at the macro level. It also hints at our creation by a god who is capable of fathoming the mysteries of our minds, but for some reason thought it better not to endow us with the capability of doing so. But before we content ourselves with these ideas, we should make sure that something less extravagant is not behind our conscious states. I do not see that this would make them any less amazing, or any less magnificent. The possibility of the existence of states of bare consciousness holds the key to understanding consciousness in physical terms. Several candidates for these states can be found, including states in the brains of autistic people, states of people engaged in meditation and certain types of states in the brains of comatose patients. This is original, unpublished work, not submitted for publication elsewhere. I would like to thank Rocco Gennaro and Ajai Singh. Can consciousness be equated with a type of thalamo-cortical binding oscillation? Can conscious states exist in the parietal or temporal lobes without active connections to the prefrontal cortex? Can one person experience the conscious states of another? Do people with autism have conscious states without active prefrontal connections? 1. Block N. Consciousness, accessibility, and the mesh between psychology and neuroscience. Behavioral Brain Sci 2007;30:481-99. 2. Block N. The nature of consciousness: Philosophical debates. Cambridge, MA: The M. I. T. Press; 1997. 3. Crick FC and Koch C. Towards a neurobiological theory of consciousness. Seminars in the Neurosciences 1990;2:263-75. 4. De Sousa A. Towards an integrative theory of consciousness: Part 1 (Neurobiological and cognitive models). Mens Sana Monogr 2013;11:100-50. 5. De Sousa A. Towards an integrative theory of consciousness: Part 2 (An anthology of various other models). Mens Sana Monogr 2013;11:151-209. 6. Gennaro R. The consciousness paradox: Consciousness, concepts, and higher-order thoughts. Cambridge, MA: The M. I. T. Press; 2012. 7. Goldberg II, Harel M, Malach R. When the brain loses its self: Prefrontal inactivation during sensorimotor processing. Neuron 2006;50:329-39. 8. Hameroff SR. The brain is both a neurocomputer and a quantum computer. Cognitive Sci 2007;31:1035-45. 9. Hirstein W. Mindmelding: Consciousness, Neuroscience, and the Mind's Privacy. Oxford: Oxford University Press; 2012. 10. Hirstein W. The contribution of prefrontal executive processes to producing a sense of self. Mens Sana Monogr 2011;9:150-8. 11. Kana RK, Libero LE, Moore MS. Disrupted cortical connectivity theory as an explanatory model for autism spectrum disorders. Phys Life Rev 2011;8:410-37. 12. Lamme VA. Why visual attention and awareness are different. Trends Cogn Sci 2003;7:12-8. 13. Lou HC, Nowak M, and Kjaer TW. The mental self. In Laureys, S, [editor] The Boundaries of Consciousness: Neurobiology and Neuropathology. Amsterdam: Elsevier; 2005. p. 197-204. 14. Monk CS, Peltier SJ, Wiggins JL, Weng SJ, Carrasco M, Risi S, et al. Abnormalities of intrinsic functional connectivity in autism spectrum disorders. Neuroimage 2009;47:764-72. 15. Owen AM, Coleman MR, Boly M, Davis MH, Laureys S, Pickard J. Using functional magnetic resonance imaging to detect awareness in the vegetative state. Archives of Neurology 2007;64:1098-102. 16. Penrose R. Shadows of the Mind: A Search for the Missing Science of Consciousness. Oxford: Oxford University Press; 1994. 17. Tong F. Primary visual cortex and visual awareness. Nature Reviews: Neuroscience 2003;4: 219-29. 18. Zeki S, Bartels A. Toward a theory of visual consciousness. Consciousness Cogn 1999;8:225-59. William Hirstein is a Professor of Philosophy at Elmhurst College in Elmhurst, Illinois, USA. He is the author of several books, including On the Churchlands (Wadsworth, 2004), Brain Fiction: Self-Deception and the Riddle of Confabulation (MIT, 2005), and Mindmelding: Consciousness, Neuroscience, and the Mind's Privacy (Oxford, 2012). He also writes a regular blog called Mindmelding: Philosophy Meets Neuroscience, at www.psychologytoday.com/blog/mindmelding. His web site is at www.williamhirstein.com. Dr. Hirstein's other interests include autism, sociopathy/psychopathy, brain laterality and the misidentification syndromes.